Mount Fair is a well-preserved antebellum property located in the valley of Brown’s Cove in the foothills of the Blue Ridge Mountains in Albemarle County, Virginia. The Brown family constructed the main residence in 1848 and it is on the National Register of Historic Places. Over the years, Mount Fair has retained its rural setting of wooded hills and green fields. Today, the property is operated as a self- sustaining farm and vineyard. In keeping with his status as a prosperous farmer, William Brown commissioned a house with elegance and great detail. It was built on a raised base- ment on a foundation of stone and brick. The entire building is covered with unbeaded weatherboard with corner-boards, as well as boxed cornices with dentils. The signature belvedere sometimes referred to as a widow’s walk sits atop the hipped roof. The main house retains much of its original interior and exterior charm. When Mark Finlay, an architect from Southport, Connecticut, was invited to assist in the renovation of this historic home and to improve the entire property, he found the house amazingly intact for its age. The three American bond-laid brick chimneys still served seven of the nine fire- places, as well as unusual features such as an eight-paneled east-facing front door. Finlay has a strong connection with Virginia. His ancestor Mann Page was one of the state’s original settlers. Page began building Rosewell in Gloucester, Virginia, in 1725, which upon its completion was one of the most elaborate private residences in the American colonies. (The home burned down in 1906.) Finlay understands that creating a home is not about grandiosity and self-importance – rather, it is about comfort, livability, utility and the joy it brings. He also understands the importance of preserving history and is careful not to leave any fingerprints when working with historically important structures. Over the years, Finlay has amassed a diverse portfolio of projects throughout North America, including custom homes, estates, clubhouses, historic- landmark renovations and commercial buildings. His firm has received more than 30 architectural and design awards. The 1,108-acre property of Mount Fair is part of the original 2,850 acres granted by King George II to David Mills in 1739. 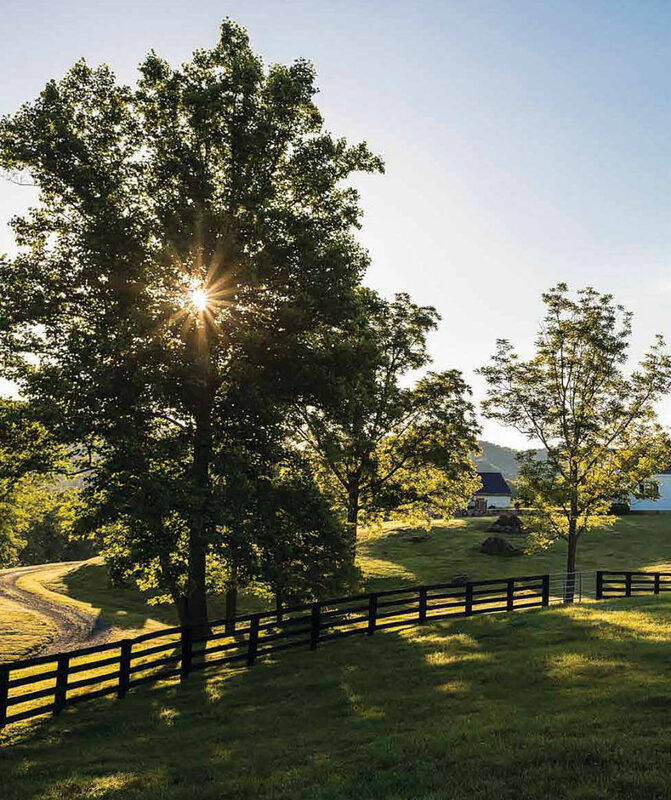 Upon entering the property, a winding drive traverses fields with four-board fences, waterways and paddocks with horses grazing peacefully, and ends at the main residence. 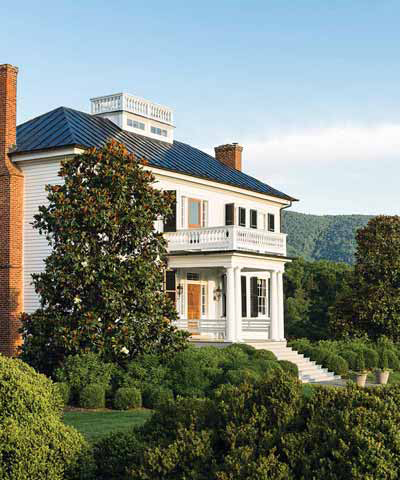 The Greek Revival home sits on an elevated site surrounded by original outbuildings, specimen trees and boxwoods. 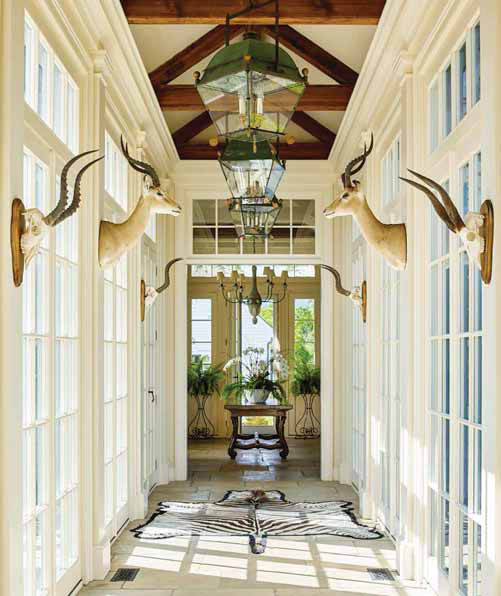 A breezeway joins the kitchen to the hunting room. The main entrance opens to a foyer flanked by the living room and dining room. A staircase leads to the bedrooms upstairs. The original poplar newel post that anchors the stair rail has an unusual vase shape. Both living room and dining room have heavy molding, chair rails and symmetrical moldings with bull’s-eye corner blocks at door surrounds. The original icehouse, detached kitchen and springhouse near the main house have been converted to guest cottages. Remnants of enslaved workers quarters are preserved. The Brown family cemetery is located on a hill above the house and the earliest legible marker is that of William Brown (1799-1876). A cemetery for the enslaved workers is located below the house on a small ridge. The latter, having been carefully restored upon consultation with local archeologist Lynn Rainville and the help of landscape designer Thomas Woltz, is now a lovely space cornered by four fieldstone pillars. A short walk from the main residence is a new 12-stall horse barn. The barn has tongue-and-groove siding and simple fenestration. Finlay wants to distinguish old from new and domestic from agricultural. 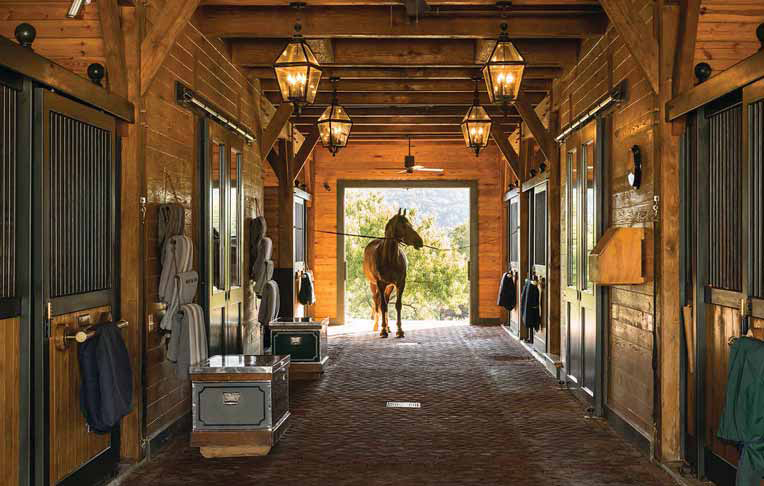 Other equestrian facilities include outdoor and indoor riding arenas and jump shop. A vineyard with cottage, greenhouse with garden shop and staff quarters completes the property. Finlay’s effort to preserve history has been successful: A walk among the buildings and grounds today leads one to feel not much has changed from another era. Mount Fair is one of the properties featured in the book Country Houses: The Architecture of Mark P. Finlay, by Gina Tsarouhas, due to be released in May this year. The first homes Finlay designed were for critters he rescued from the woods near his home in Northbrook, Illinois (a Chicago suburb now entirely developed), at the age of 14. He quickly learned that homes are not a one-size-fits-all affair. He learned to pay attention to the different animals’ behavior and the way they live. He and his father built shelters to suit each animal’s needs. The new 12-stall barn is finished with tongue-and-groove siding and pays homeage to the post-and-beam construction of historic farm buildings. The living room entrance frames a view of the unusual vase-turned poplar newel post that anchors the stairway. Both living room and dining room have bull’s-eye corner blocks at door surrounds. An arbor on the side of the main residence looks out to the preserved smokehouse and the north lawn. The cupola-topped roof line of the barn against Blue Ridge foothills in the distance with area architects, including Raymond J. Kelley, Gary Lindstrom and David Coffin. Finlay studied structural engineering at Wentworth Institute of Technology in Boston and received his bachelor’s degree in architecture from the University of Kentucky where he earned top honors in architectural design. In more than three decades of practice, respecting his clients’ wishes is of the utmost importance to him and he pays close attention to what his clients are telling him. “When people talk about a Mark Finlay home, I want that to mean a place that is a genuine and enduring celebration of the families who live there,” says Finlay. Mount Fair is a true expression of Finlay’s touch. Hay Hardy is a VAS staff writer.